First of all we'd like to thank Shain for inviting us to introduce ourselves to this group. Our names are Joe and Kay Lynn Nield. We have 7 children and live west of Afton on the Salt River. We are the fifth generation to live and work on this ranch. Our goal is to continue to operate a viable ranching operation here in Star Valley for our children and future generations. 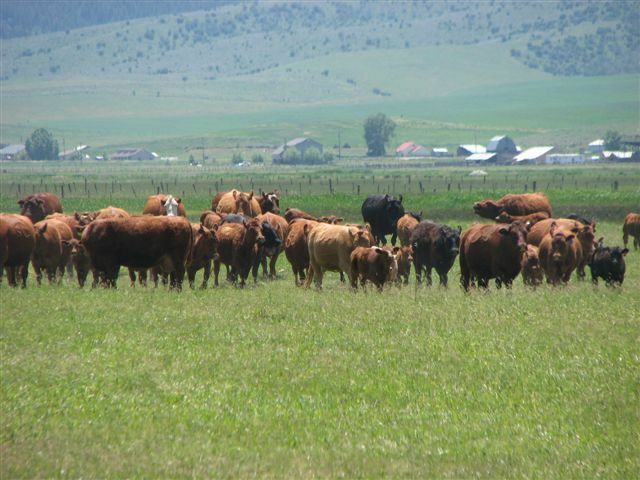 While we maintain a commercial cow calf operation, we would like to provide more beef locally. We have done this the last few years for friends and family, with good results, we also provide beef for Rulon's Burger Barn. Our beef is produced naturally, meaning we don't use growth promotants or antibiotics. We have finished cattle using a traditional corn, barley and molasses ration. We have also finished cattle on an all forage ration, which means no grains anytime just grass and long stemmed hay. We have had good results with both, but are concentrating our efforts on a grass finished product due to its increased health benefits, and it can be produced in a more sustainable manner than a grain fed product. 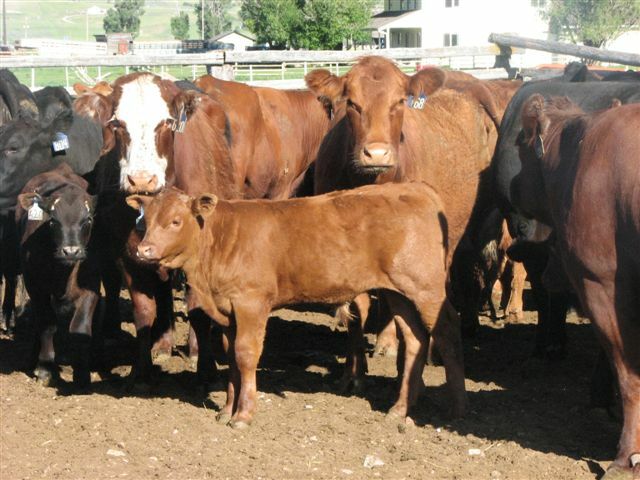 Our beef is processed at Theurer's Custom Meats in Lewiston, Utah. They are federally inspected, family owned and operated plant. If you are interested in our beef or have any questions about our operation or management practices, feel free to call or email us, we'll do our best to help you. Out with the old and in with the new. This past week Shain tilled under some of the older salad rows we've been harvesting from and the empty rows where the boc choi and Chinese cabbage grew. He replanted them with new summer crops. Brrrrr, not again! Monday night the temperatures dropped to below freezing. So our plans for harvesting salad on Tuesday morning were ruined because the salad had frozen. Luckily salad can bounce back from a "light" freeze and be ready to pick again in just about 24 hours. In preparation for the anticipated temperature drop, we went out and covered all the "outside" beans (meaning they are plated outside of the greenhouse). It looks as though everything else made it through the cold just fine. I am sorry to report our shallot crop failed miserably this year. Out of the 100's of shallot bulbs we planted last fall, only 25 or so are growing. We aren't quite sure what caused this. We dug around in the soil a bit only to find moldy, mushy shallot bulbs. However, the garlic is growing wonderfully! We'll try again next year with the shallots. "Scapes" are the flower stalks found on members of the Allium family (onions, leeks, chives, and garlic). Garlic scapes curl upward as they grown, ultimately straighten, and then grow little seed-like bulbs. When garlic scapes are still in full curl, they are tender and delicious. They provide subtle garlic flavor (but without the garlic "bite") and cruchiness if added to salads and soups. They cook well in stir fries, and can be processed in vinegars, as pickles, or into a green "pesto" sauce. This pesto is delicious spread on pizzas or sandwiches. Garlic scapes are only available for a few weeks of the year, so enjoy them while you can. Cut scapes to green bean size and saute them in butter and salt for 6 to 8 minutes. During the last minute of cooking add about 1 teaspoon of balsalmic vinegar. Puree scapes and olive oil in a food processor until smooth. Stir in Parmesan and lime or lemon juice and season to taste. Serve on bread, crackers or pasta. I have seen many variations to this recipe. Many omit the juice and will add nuts (like pine nuts or walnuts). 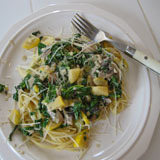 I also added several new Swiss chard recipes to our website this week. 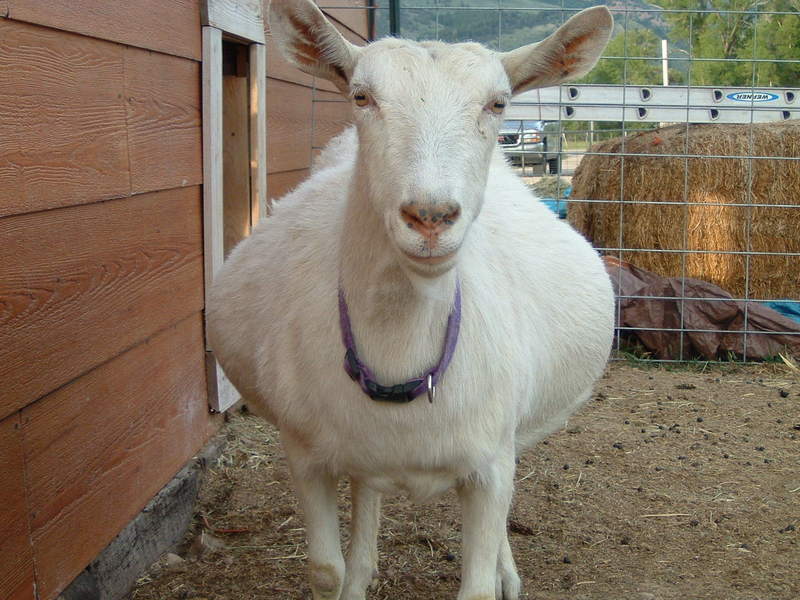 In our search for local food producers we found Paul Smith, who lives in Afton, WY. A few weeks ago I went to his home and purchased about 10 birds for the freezer. They had been "taken care of" just the day before. You can't get much fresher than that. Then last weekend we cooked these two dutch oven style in the back yard. It was an evening of good eatin'. 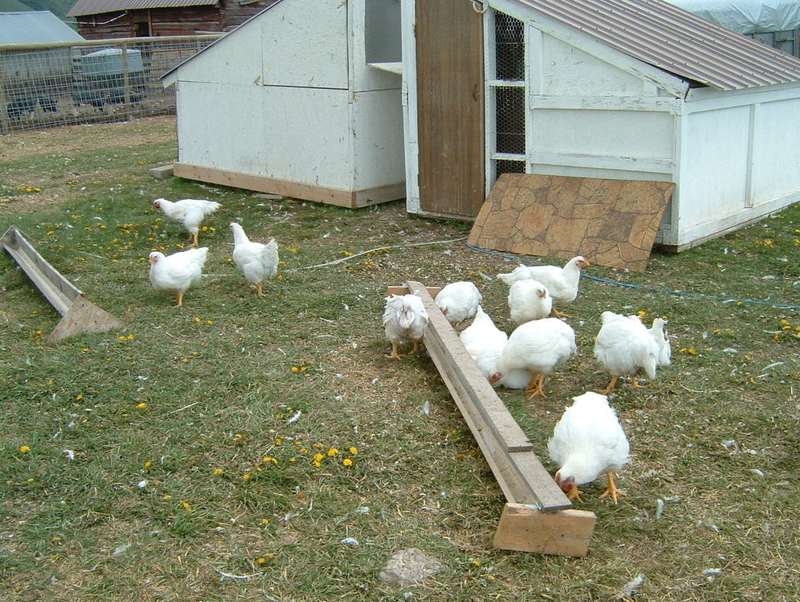 Paul raises cross-bred broilers, which are a cross between a Cornish hen and a White Rock rooster. They reach processing size in under three months. The small birds are allowed out of the coop just as soon as they are big enough that the neighborhood cats leave them alone. Paul mixes their ration himself to avoid any unwanted ingredients. In addition to their outside food sources, they get all natural local barley, supplemented with vitamins and minerals, and soybean meal to supply the necessary protein. No antibiotics, hormones or animal by products are used. When it comes processing time, Paul and his wife Denise do all of it themselves. At no time are the birds subjected to unnecessary trauma. They are dispatched as humanely as possible. 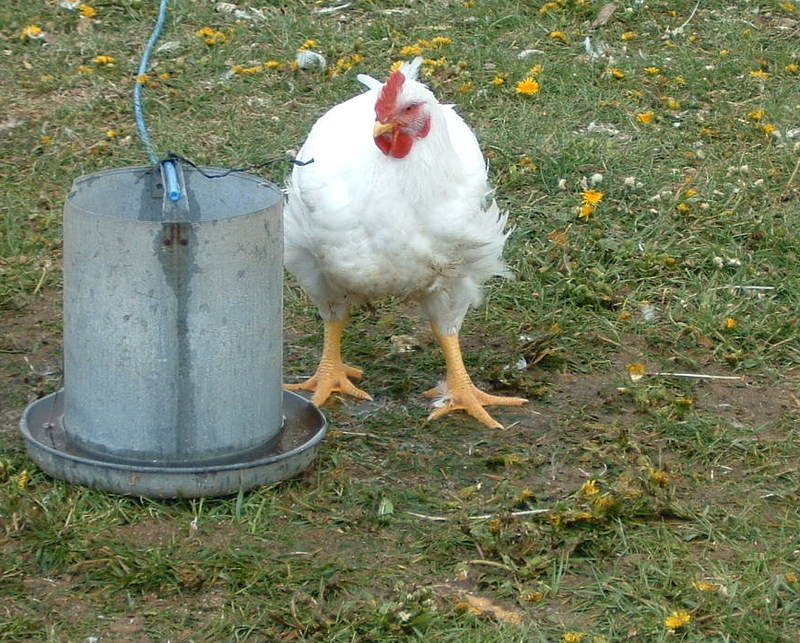 Only pure clean water is used to process the birds, never any chlorine or chemical washes. They are cooled immediately, refrigerated and allowed to age unfrozen for at least 24 hours. Then they are packaged, labeled and frozen, if not already sold at that point. 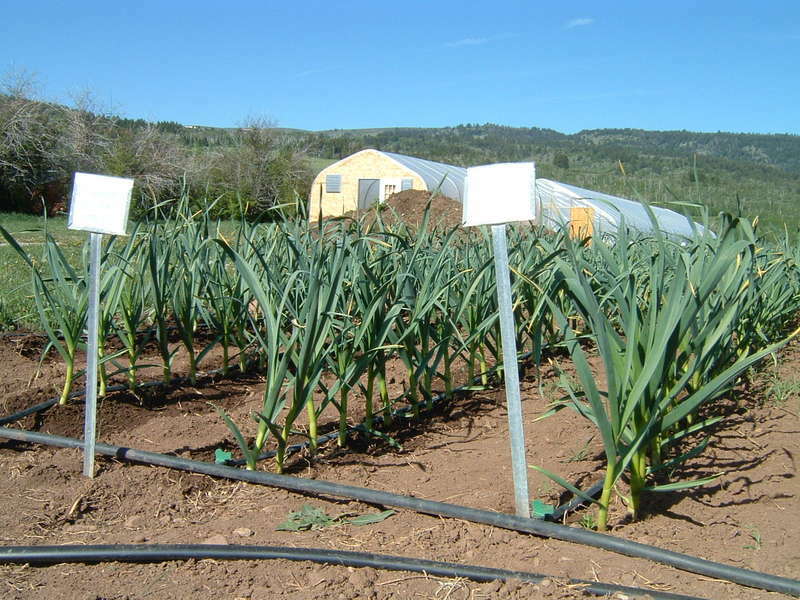 The first harvest took place in May, the last batch being ready around the end of October. Paul is also raising broad breasted white turkeys, using the same criteria as above. They will be available in November, just in time for Thanksgiving dinner. 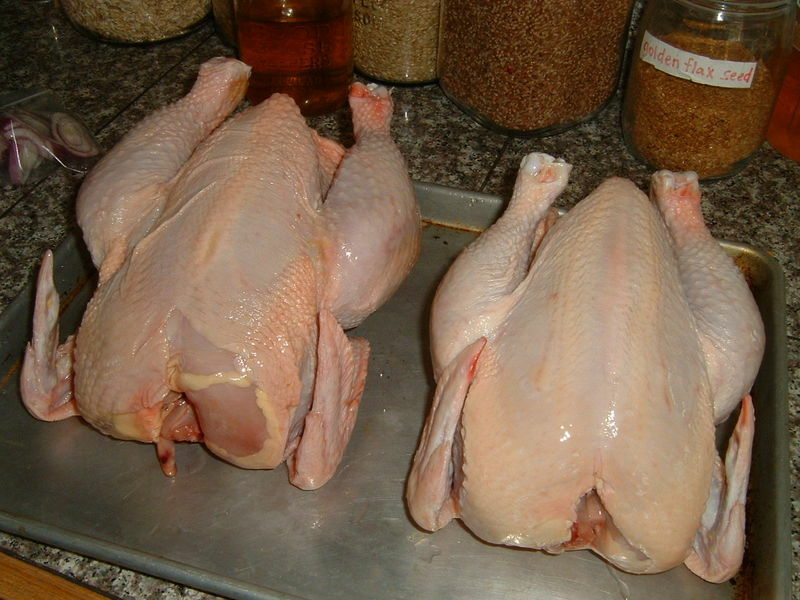 The price for chickens and turkeys is $1.65 per pound. Call in advance to check for availability and/or place an order. If you are interested in pork, Paul is also raising Berkshire hogs, also know as Kurobuta pork. This is the best of the best for your table and is only available in high end markets and restaurants, with the majority of the breed being exported to Japan. The pigs are carefully raised using Paul's unique feeding regime to weigh in excess of 325 pounds. This yields a larger more desirable carcass, which can then be delivered to a processor of your choice. A $75 deposit will hold a place in line for the next available harvest, with a waiting time of about a year. The total price for a hog is $200, plus the processing of your choice which usually costs anywhere from $150 to $200. This is Trinidy. If you can't tell, she is pregnant. Her due date is June 26th, but I've decided it's probably a good idea to start checking on her every few hours. We are really looking forward to having more "kids" here on the farm. I'll post some pictures after they are born. This past week we've had 4 groups of people tour of the farm. 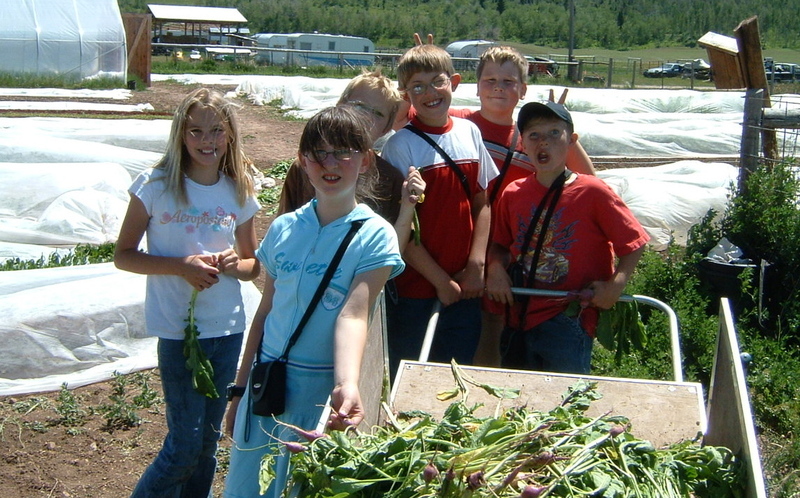 This is a picture of some students from Holldaway Elementary School who came on Wednesday to see the farm and do a little work. We showed them all the animals, the greenhouses, and the fields of growing produce. 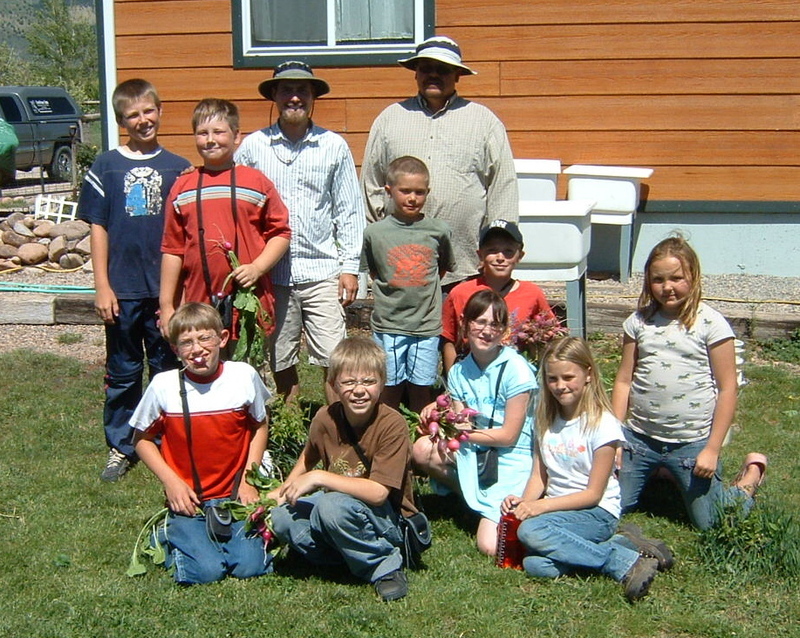 Shain taught them a little about the difference between our farming practices and those of industrialized agriculture. 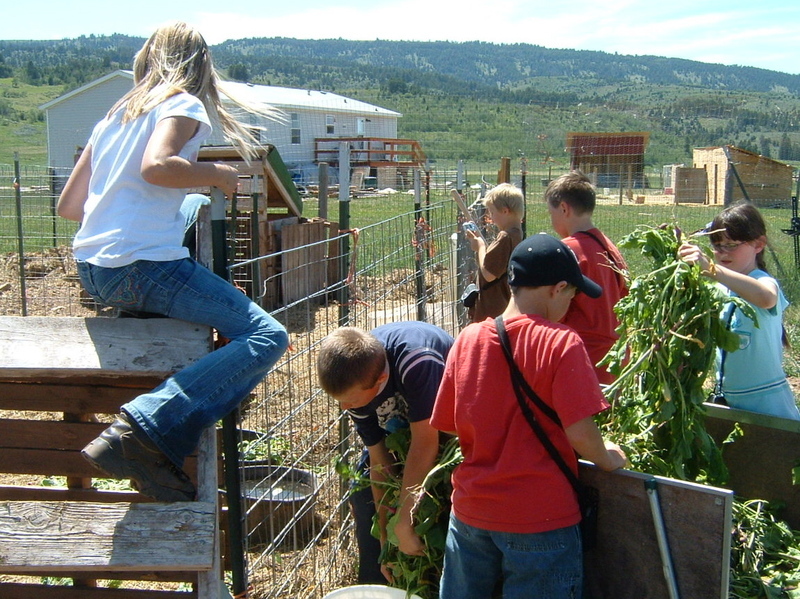 Then we put the kids to work pulling old radishes and feeding them to the pigs (photos below). Here is the inside of greenhouse #4, the tomato house. 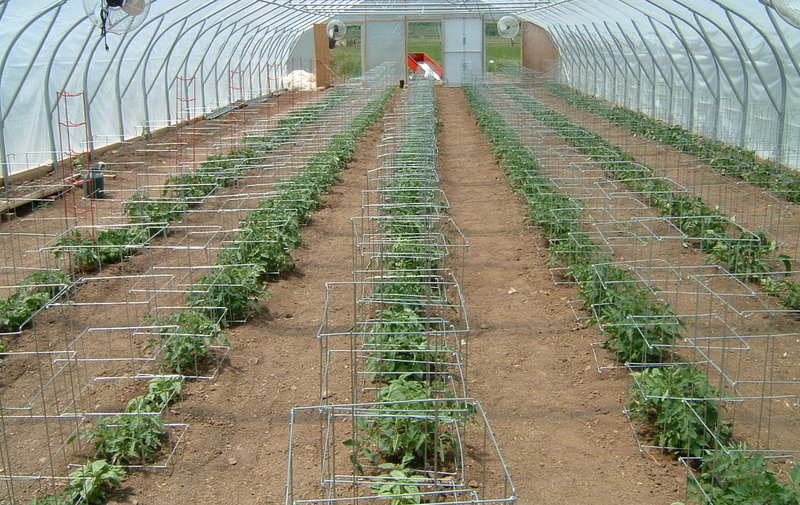 The plants have grown to the point that it was time to put up the tomato cages. The past few days it has gotten so hot in there that we've had to turn on the fans to keep the air circulating. Tomatoes like it hot. Some plants are already setting blossoms! Yeah! Occasionally you will see bags in the coolers with someone's name on it. Unless you are that person, please don't take it. A few CSA members don't have email, so I put a printed copy of the newsletter in their bag of produce. Also, there are times when I send extra food for someone so I'll have their name on a bag. If you didn't ask for anything extra, just take a normal unmarked bag. This past week there were at least 3 shares of produce that did not get picked up. I was a little surprised with it only being the second week of the season. This gets me to worrying that there was some kind of confusion or mix up. Most likely, someone just wasn't in town to get their food. Then I start to think about the good food that went to waste. (Yes, sometimes I think too much.) Please know that if you are ever not able to get your share, you are certainly welcome to have someone else pick it up. Just give them clear instructions (like the ones I'm giving you now), or call and we can make some kind of arrangements. As you may have noticed, we use a lot of recycled plastic grocery bags. Just last week we used over 120 bags. At this rate, I'm going to run out in a few week. Please send us your clean, dry bags. Just leave them in or by the coolers at your pick-up location. The weather has gotten much warmer so quickly that the veggies are growing like crazy. Shain says there are times you can literally see the growth from one day to the next. Unfortunately, this also means some of the cold weather crops are bolting (this is when the plant sends up a seed stalk and often the flavor turns bitter.) So, this will be the last week you will get the boc choi and cabbage. The radishes and turnips are going to seed too, but we should be able to get another week out of them. We decided not to certify EverGreen Farm and CSA produce as organic. Considering ourselves traditional organic farmers, we oppose the USDA’s corruption of this word. Our opposition formed because multinational corporations unfairly influence agricultural policy regulating organic food production. In the 2006 Agriculture Appropriations Bill, a rider sponsored by the Organic Trade Organization legalized the application of 38 synthetic substances to organic foods (The Organic Trade Organization is a lobbying group that represents the largest agribusiness interests like Kraft Foods). The USDA claims the application of these substances to food is harmless. However, to my knowledge no evidence exists supporting this claim; I could not find a single trial conducted by an unbiased organization that was either honest or reliable. Furthermore, in 1997 the USDA declared the use of sewer sludge, irradiation, and genetically modified organisms “organic.” As you most likely guessed, The Organic Trade Organization also influenced this misguided legislation. Public outcry forced the USDA to repeal this ridiculous mandate. Not only does USDA organic certification fail to protect consumers from non-organic substances in our food supply, but it also falls far short of numerous other practices considered paramount by traditional organic farmers. 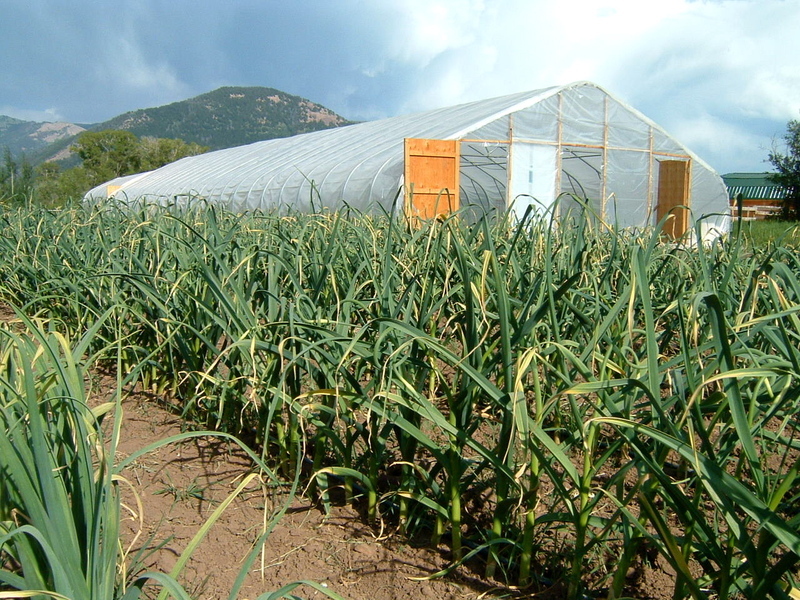 Failing to address labor issues, healthy soil practices, and appropriate animal husbandry also demonstrates the unreliability of USDA organic certification. Can industrialized farming operations relying on cheap and illegal labor, monoculture, and confined animal feeding operations be considered humane or environmentally friendly? And, are such practices in any way organic? My apologies for the rhetorical questions. I believe the USDA is far removed from the original ideas proposed by the founders of the organic movement. My understanding of the writings of Rudolph Steiner, Sir Albert Howard, J.I. Rodale, J.H. King, and Wendell Berry emphasize agricultural ideals different from those mandates embraced by the USDA. For these reasons EverGreen Farm chooses not to certify organic. In the future I will discuss in great detail an alternative to USDA certification. The program in which we currently participate is Farmer’s Pledge. Following that article I hope to clearly map, document, and visually represent the agricultural beliefs to which our farm adheres. Greetings to you all! I am happy to report the weather has been wonderful for this week's harvest. What an improvement over last week's weather. Whatever Mother Nature brings our way, we have a good time working together. Good People. Good Conversation. Good Food. I am particularly in awe of the Chinese Cabbage (above). This is our first year growing this variety. We started it from seed in the greenhouse, along with the bok choi and Swiss chard. It was one of the first crops to be transplanted outside back around April 25th. Since then we've kept it row covered to keep out the flea beetles and add some warmth to help it grown a little faster. I am quite please with it's over all appearance. I kept holding a bunch in my hand, thinking it made a beautiful bouquet. The leaves are long and frilly, showing very little insect damage. The texture is a bit thicker than leaf lettuce. The flavor is mild, but I think it is consistent with the taste of cabbage. Shain thinks is has a slight mustard green kick. I'm not sure how I'll be using these greens in our menu this week. I know I want to throw some into the egg roll filling I've been making and hiding away in the freezer. 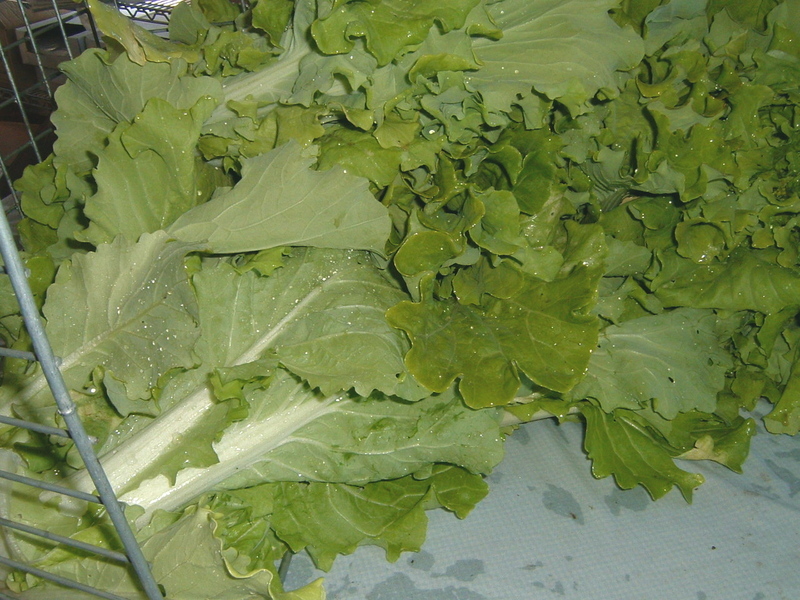 On the internet, I saw many recipes using Chinese cabbage. Even one recipe that I swore was just a Utah Mormon phenomenon - Chinese Cabbage Salad with Ramen Noodles. (NO offense intended towards Utah Mormons or those who like Ramen Noodles. This must stem from a bad childhood memory.) 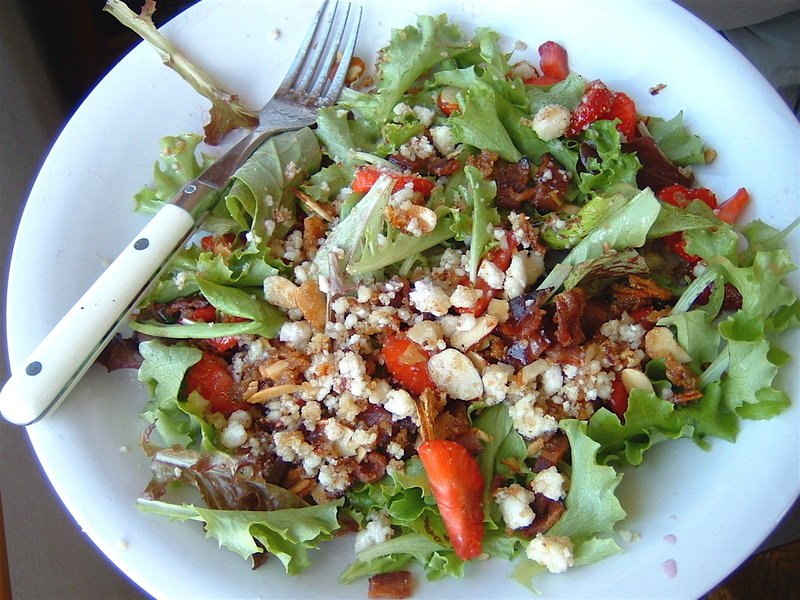 Another recipe I'm liking is for Chinese Chicken Salad. Let us know if you find another yummy way to use these greens. 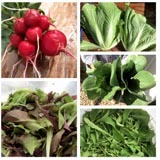 We have received so many compliments on our salad mix. Thank you! This time of the year the salad is really wonderful. It gets to be more of a challenge to grow, harvest, and wash as the weather heats up, but it is our goal to get it to you every week. I could eat a nice salad like this everyday. Why should a nation produce its own food when others can produce it more cheaply? A dozen reasons leap to mind . . . but most are quick to dismiss as sentimental. I’m thinking of the sense of security that comes from knowing that your community, or your country, can feed itself; the beauty of an agricultural landscape; the outlook of the kinds of local knowledge that farmers bring to a community; the satisfactions of buying food from a farmer you know rather than the supermarket; the locally inflected flavor of a raw-milk cheese or honey. All those things—all those pastoral values—globalization proposes to sacrifice in the name of efficiency and economic growth. Sometimes I ask myself why I ever became involved in agriculture. This question resonates most loud in the middle of the summer when I find my heart and mind fixated on the serenity of a trout stream and the simple pleasures of fly-fishing. Most times now other satisfactions—pastoral ones—coexist with my other favorite pastimes. This year we hope to share more of the beauty of our farm through a celebration, an open invitation to visit us, and a photo album posted on our website. Yes, the food we lovingly grow, the food on which you dine, has many virtues: flavor, nutrition, balance, harmony, and sustainability, just to name a few. However, locality is the greatest strength of our food! First, your support of our farm has contributed to the growth of our family as farmers, cooks, naturalists, self-reliance enthusiasts, and old-time farming throwbacks. We hope to share our knowledge with you. Most of all, we would love to contribute to the vanishing domestic culinary art of preparing and feasting on local and seasonal foods. Please use our website; we have found great pleasure in the food preparation techniques presented in the recipes posted therein. We are also proud to announce that we are members of a local Slow Foods convivium, an organization dedicated to the ideals preached in this letter. Your commitment to our farm makes the air we breathe, the water we drink, and the life with which we have equal stakes on our planet infinitely healthier. 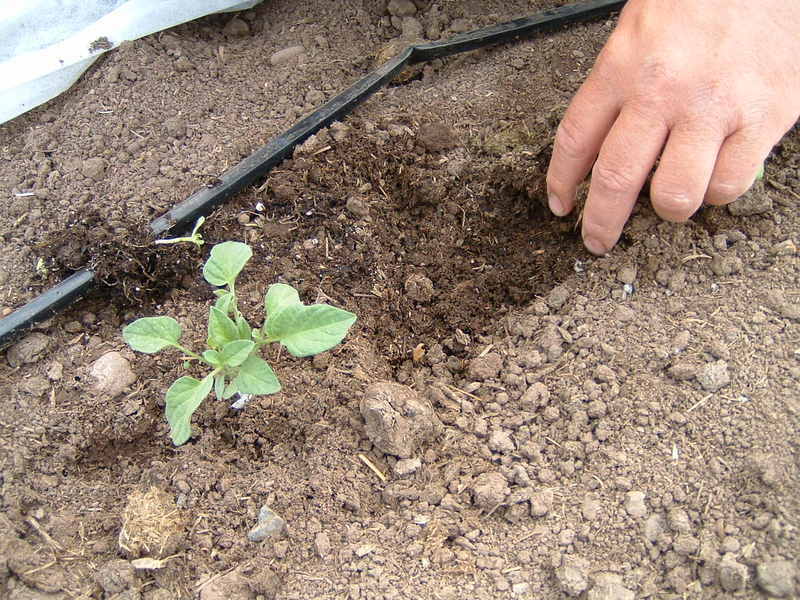 With typical industrialized agricultural practices, 100 pounds of synthetic/petrochemical fertilizer per acre is annually used to grow several staple food crops (corn, potatoes, wheat). However, many conventional growers admit they often apply double the amount to ensure a “good harvest.” And this is only a fraction of the fossil fuels and chemicals required to provide factory foods! Other petrochemical inputs include weed and pest controls as well as preservatives (most conventionally grown produce is subjected to ten chemical applications). Last, consider the fossil fuel requirements involved in shipping your food from the irresponsible distances of Chile and China? The untold burden of not eating local food will be written in the chronicles of history as one of our times greatest consumptive sins. Last, buying local means more of your food dollars stay local. Tens of thousands of our collective food dollars have been recycled back into the pockets of those in our community. The purchase of land, animal feeds, water wells, construction materials, labor, advertisement, marketing materials, and much more have been required for the existence of our farm. Your decision to support us is an action that builds a stronger local economy. Some parting words. Please keep more of your food dollars local. Seek out and support other Star Valley farmers too. Many more are needed. One such rancher exists, Joe Nield. After several conversations with Joe about his farming philosophy and practices, I offer my full endorsement of his grass-fed beef. Also, Paul Smith with Wyoming Chicken Ranch and the Shumway’s Dairy are contributing to our local food chain. Please join us to seek out and support more Star Valley farmers for a better future. Stay tuned for more information on these local food producers. About 3 weeks ago, Shain discovered a cutworm in the tomato greenhouse. Actually, he discovered the remains of a tomato plant after it had been "attacked" by a cut worm. Not good. Then he found another, and another. So we started a new routine on the farm. Every morning, noon and night we go out to greenhouse #4 and walked up and down each row in search of a sign that a nasty cutworm is near. The picture above is what we were looking for. This is a basil plant. It is about 2 to 3 inches tall. The leaves you see on the ground to the left are about 1/2 to 1 inch wide. They have been chewed off by a cutworm. 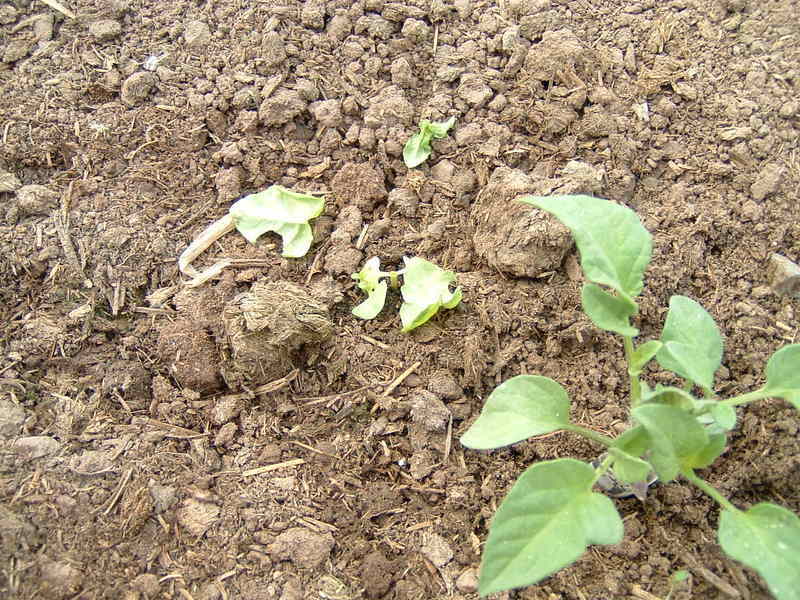 The cutworms will also chew down an entire basil plant or tomato plant. Once we have identified an area where a cutworm has recently been, we search the area by slowly sifting through the surrounding soil. It's a little like looking for a needle in a haystack. Most of the time we are lucky enough to find the culprit and when we do...he's a goner. 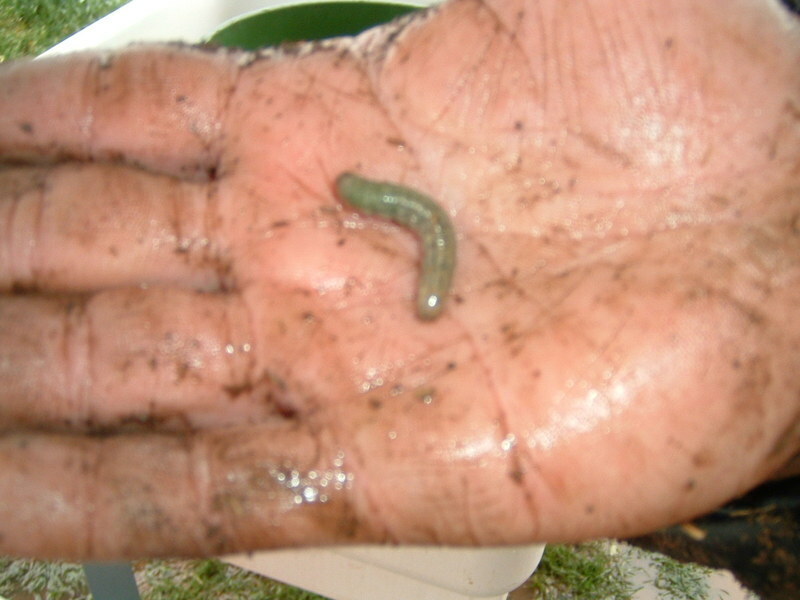 This is a cutworm before Shain takes pleasure in squishing him with his bare fingers. Over the past few weeks these guys have cut down approximately 15 tomato plants and 40 basil plants. Not good. 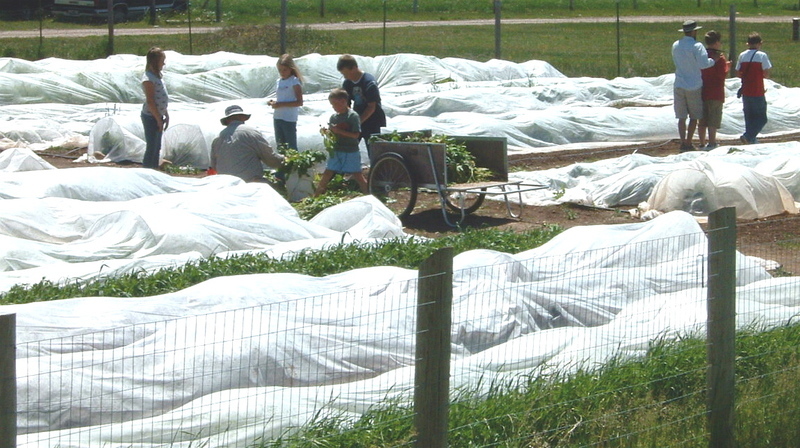 As an update - Last week, the day it snowed like crazy, we (us farmers and some workshare helpers) wrapped a newspaper strip (aka "cutworm collar") around the base of each and every tomato plant. This should slow those buggers down a bit. The past few days we haven't seen much sign of them. This is good.